The garage door opener in my house works perfectly well. It’s a craftsman chain drive and it’s a bit noisy but every time I push the button on the remote in my car, the door slowly moves upward and I can pull my car into the driveway. No worries, right? One evening I pulled onto my street, however, and my garage door was sitting open for all to see, with bicycles, tools and an unlocked interior door that offered easy access into my house. It’d been that way for over six hours. Not good. But how do you know if you remembered to close your garage door every single morning? It only takes one forgetful departure to lose hundreds or even thousands of dollars worth of household goods. Enter the Sears Craftsman AssureLink communications system. It’s a three piece solution that lets Craftsman sell Internet-aware garage door openers that can not only be accessed via the Web to confirm the door is properly closed, but that have a handy iPhone (or Android) app that lets you control the door too. Fabulous. 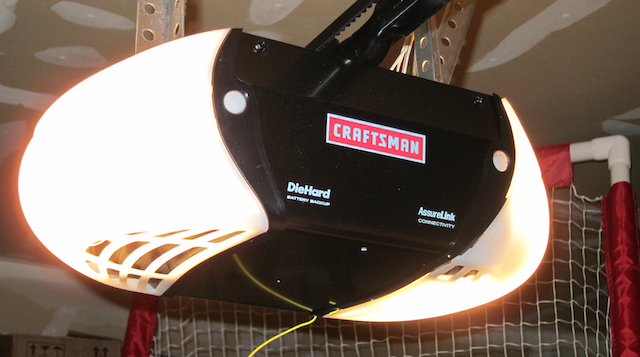 After some discussion with the Craftsman team, they generously agreed to install one in my garage to test and experiment with, and a few days later I got a call from the Blue Crew, Sears appliance installation and maintenance team. The following morning Tom, my service guy, arrived and quickly replaced my old garage door opener with the Craftsman 3043 belt-drive garage door opener with AssureLink. Installation was easy because my springs and rails were in good shape, but it still took about 90 minutes. The upgrade including a new exterior keypad (helpful for letting friends in, though now that I can open it remotely, they can just text me and I can send the “open door” signal from anywhere in the world. How cool is that?) and a completely updated interior door open button that includes an LCD readout and temperature sensor. Let me show you some pictures so you can get a sense of what I’m talking about. The main garage door opener unit, with two vibration resistant 60w bulbs installed. As a belt-drive unit, it’s startlingly quiet. In fact, it’s so quiet and vibration free that I can now open and close the garage door without waking up anyone sleeping in the bedroom above, which is nice given my erratic schedule. As mentioned earlier, the interior wall unit is far more sophisticated than any I’ve had before and includes an LCD screen with status readouts, including the interior temperature of the garage. Above you can see it’s a warm 54F in the garage. The main drive unit is sleek and quiet, but what’s by far the coolest feature is the AssureLink system, with its Web-based interface and mobile app. Simple enough. If it were closed and I wanted it open, I could simply slide the control to “open” and within about ten seconds the garage door itself would be open. Tap on the garage door image and it will open the door or, if it’s open, close it. I have it set with a four digit security code (something you can set by tapping on the little gear “preferences” option in the app) which is a must. Prior to changing that app security setting I had to enter my login and password each time, way more frustrating. The frustration with this device is that it’s not a pass-thru Ethernet so you might end up needing to buy an Ethernet hub if you only have a cable modem or otherwise don’t have a spare jack to utilize. It’s a curious decision on their part, presumably to save a few bucks, but it’s the biggest complaint I have with the entire system. If our office wasn’t already drowning in connections and cables, it could be a surprise additional $50 needed. Hook everything up, though, create an account at the AssureLink Web site, tie it into your new Craftsman garage door opener, and you’ve just set up an incredibly cool smart home device, a whisper quiet belt-drive system that lets you monitor your garage door from anywhere and gives you the control to open or close it from your mobile device or office desktop. I really, really like it. Details: Sears Craftsman 3043 Garage Door Opener with AssureLink. $231.99 direct from Sears. Estimate installation cost at about $200 if you can’t do it yourself. Disclaimer: Sears sent us the 3043 garage door opener with AssureLink for review, and paid the cost of installation. This doesn’t affect our opinion that it’s the best garage door opener we’ve ever seen, however. It’s that cool. I added Craftsman AssureLink Garage Door Opener Smartphone Control Kit 53999 to my garage door opener 4 years ago. It worked flawlessly until today. Wall Control Unit started beeping and LEDs flashing (two quick beeps every 3 seconds and two quick red and orange LED flashes in between) leading to Wall Control Unit not responding to any commands and not opening/closing garage doors. I disconnected wall unit for 10 minutes (until red LED on it stopped flashing), unplug garage door opener, reconnected wall unit and plugged in power to garage door opener which made it work again for whole 15 minutes, then whole thing with beeping, flashing LEDs returned and made wall control unit unusable again. Is there some battery on logic board of Wall Control Unit than needs to be replaced (LED light was still flashing for few minutes after it was disconnected from power, so i assume there must be small battery in there somewhere) or I need to replace Logic Board or whole Wall Control Unit??? Wish I had a good answer for you, Robert, but I have no idea what you’re experiencing. Could it have gotten wet? I just installed a craftsman 3043 garage door opener and everything worked fine. I was then setting up the assurelink connectivity hub. The blue light came on and stayed on but the green light would light and go off. I also set up my account but when I typed in the Serial Number, it acted like it could not recognize the hub. I then did a Hard Reset, Blue and Green Lights Blink and then both go off. Tried this several times and same results. No suggestions. I’m also noticing that suddenly my garage door opener is sending random event messages to me even when it hasn’t opened or closed. Weird. I have a Craftsman Belt Drive Garage Door Opener (purchased 3 years ago). I just purchased the Assurelink Kit so that I can remotely control the Garage Door Opener from my iPhone. Set up was easy enough, however, I am only able to open the garage door from the iPhone. When I try to close the garage door I get the following message: “Reverse for X(1 ..2..3 etc) minutes”. Also When I set the garage Door to close after 1, 5 or 10 minutes nothing happens. At this point all I can do is shut the door with one of the remotes or the wall control. Placed several calls to Sears and Craftsman Support with no results. I was told that the sensors may be misaligned, they work perfectly. I am hoping someone else has seen this behavior and can suggest a fix. I have Googled for hours and cannot find anyone with the same thing. Please help. I’m afraid I have no idea what’s going on with it not being able to reverse and close the garage, but I’m wondering if there’s an issue with the garage door opener itself? Does it have any status message that flashes on the monitor screen when you’re closing the garage manually? DeeCee, call HomeLink and ask them for the adapter kit. It’s clunky, but it works. It should be free too. At least, mine was. Ludo1, hmmm… to be honest, many months later, I find that I very rarely use the Internet capability of the garage door opener. In fact checking its status remotely yesterday was the first time I’d used the iPhone app in probably at least a month. But the adapter gizmo hooks up to your computer so having wifi in the garage isn’t an issue. If the adapter is too far from the garage, however, it might not be able to speak with the base unit. I don’t know the specs in that regard: my office is only about 25-feet from my garage door, so it’s close. Do you know what is the maximum distance from the assurelink to the door opener? Otherwise I’ll go for a ethernet power link connection.. I bought this opener. It wont take signals from my HomeLink vehicles. I read that a Repeater Kit is necessary. Have you any info on this? Did you hook up your laser assist parking? I’m assuming your silence means that don’t want to upset craftsman with feature requests and support issues. Mike, sounds like you have a bad unit. I’d call their support line first to see if there’s a reset or similar, but otherwise, yeah, back to the store. Good luck! Dave, I plugged the assurelink into my DSL modem and A/C power. And got nothing! No lights. Is this the frustration that you mention about? What do need to go buy to make it work? Or, is the assurelink dead and requires a trip back to Sears? I’m seeing this quite a few months down the road (Ha!) but I haven’t been able to find out if the Android app will alert you if the door is open. That’s what I really want form this system. Or are there any other features that might solve the problem of “forgetting” to close the door when leaving. My guess is that if I forget to close it I’ll also forget to check the app. Tom, not sure what the laser parking assist is (does it shoot a laser across the front of your car if you get too close to the wall? 🙂 but I’m pretty sure that wasn’t part of my install. I have two single car garage doors and installed the 3043 on both. I purchased the liftmaster/chamberlain laser parking assist but it causes a conflict. When I wire it to the safety sensor wire as instructed, the lcd readout goes blank and the laser won’t operate. I used the same laser assist with an earlier GDO, and it worked fine. Were you able to get your’s to work with the 3043? I’m just wondering on how it works? I had one of this in the past and I’m not quite sure if they work the same. I want to check this out and let see how it goes, then I’ll go back in here and give my comment, by the way Thank you for sharing me this informative knowledge about the Sears AssureLink 3043 Garage Door Opener. Thanks for the reply Dave. I have tried the hard reset and even doing this my other android also with the security feature off was still able to operate the opening and closing. Looks like I’m going to have to get another gateway with a different address and delete the account. Lesson learned to leave security features on. How do I remove a garage door opener or light module from my account? Go to your AssureLink account on the internet and follow the instructions for deleting a device from the account. How do I “factory reset” my internet gateway so that it erases all learned AssureLink devices? 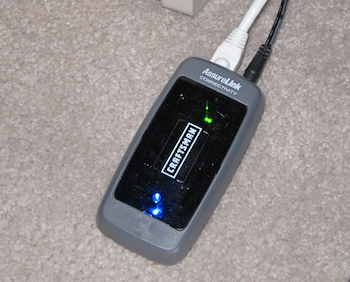 Always attempt to use your AssureLink account to erase AssureLink devices from the internet gateway. If you must force a full factory reset (a non-recoverable data destruction “hard” reset) to the internet gateway, disconnect power to the internet gateway and while powered off, use a thin tool, such as paper clip or a toothpick, to press and hold pressed the internet gateway’s reset button. While continuing to hold the reset button pressed, connect power to the internet gateway. Continue to hold the reset button pressed for 10 — 20 seconds until the gateway’s Yellow light blinks, then immediately release the reset button. Just lost my android phone and had the app on it with security feature turned off so I did not have to login each time. What do I do to protect against anyone who finds my phone from opening my garage door. Sears tech no help. Do I need a new gateway? Surprised you’re having these problems, Jim. Have you called Sears and talked with their tech team? Is your base controller gizmo (the thing that you hardwire onto your Internet connection at home) close to your garage and on a line that’s fully functional and always online? The Craftsman Assure link works like &*&$# !! I have been trying for two weeks to get it to work consistantly, I can get it to open and close with my smart phone, then next time I go to the app it does not work, I am off Line and I have not idea how to get it back on line. Not impressed, very unhappy with this product. This looks great but how slow is the belt drive on this? I had one in my previous house and it was very very slow moving the door up and down. Is it now anywhere near the speed of a chain drive? I purchased the same model. I have a 2011 Ford Taurus and 2009 Ford F150 Lariat. No problem with the Home link with the Taurus. Unable to get the Home link to work with the F150. Any suggestions. I have tried all available programming literature listed. Any idea what kind of DC motor is in those units are they brushed or brushless. I could not find this information anywhere. Dave, I purchased two of these and they work brilliantly… Except for one HIGHLY annoying feature: The iPhone app NEVER remembers my credentials and I have to log in EACH and every time I launch the app, even if I launch it and close it and re-launch it within the same minute. LAME app…and this lack of the app remembering my credentials ruins the experience because it takes too long to log in each time I might want to use it. If anyone knows the developers who built this app, please let me know so I can provide them this feedback directly. Thanks! I purchased the exact same model and love it … but … I can’t get the remote buttons in my car to program. This worked fine with my old garage door opener, but not with the new one. I had the same problem trying to program a key chain remote that my son uses. Any suggestions? James, I’ll let you know after the weekend. I have this same opener and ordered the Chamberlain sensors that arrived today. Planning on installing one on each side of the garage for my wife and I. The model number is what I was looking for. Most start with 139 so I assumed this one would also. I was looking for accessories that might be available like a parking assist like the Chamberlain offers. Since they are the same opener I assume the parking assist laser beam would also work with this opener. The garage door opener is the model 3043, James. Is that what you seek? What is the actual model number of the opener so I can see what accessories are available. Somewhere I thought I saw (one free year of service with the purchase) which I guess means that you pay for remote service after the year is up and if so how much is the service? @Dave: Interesting device but I wonder how it handles multiple garage doors at the same address? Do they all go up and down or can they be operated separately? Can it handle garage doors at different addresses (home and work and holiday house)?